After a restful night’s sleep, breakfast in the Bettyhill Hotel set me up nicely for the day. Although the coffee was frankly disgusting, the breakfast itself was very good. There were a few small clouds in the sky but it was bright and sunny and promising to be a glorious day. I was starting to feel the effects of three full days in the saddle coupled with a Babybel, bread, and fudge diet. I wasn’t particularly looking forward to putting my bum back into the saddle but once I was on my way I soon got back into the swing. After popping into the village shop to stock up on Babybel, bread and fudge, I started off by heading back down to the harbour that I walked down to at the end of the day yesterday. I wanted to see in proper daylight the fishing canning factory and ice house. It was also another point or two on the Strathnaver Trail to mark as having visited. I had a quick chat with some fishermen and a couple who were camping next to their sports car by the old harbour jetty. Everyone seemed to be enjoying the lovely morning. Leaving the village you drop down from the hill of Betty into the valley past the Clachan Burn where an old church has been converted into the Strathnaver Museum; the people behind the Strathnaver Trail. The museum itself is another one of the items on the trail but sadly I was too early to visit and with a long day ahead I couldn’t hang around until opening time. I did have a wander around the graveyard to find the Farr Stone; an 8th century Pictish stone now housed in the middle of the graveyard. After leaving Bettyhill the road starts to climb back up onto the hills of Sutherland. I took the climb slow and steady as my legs warmed up for the day. I knew I had a few hills ahead so there was no point in pushing things too hard too early. Indeed the rest of Sutherland would prove to be hilly with some lovely ups and downs out of the various valleys running from the highlands into the sea. At the top of the first hill there is a viewing point where I could stop, get a breather, and look back West at the hills behind me. It has a handy board pointing out their names. From the viewing point there was a lovely fast ride downhill into the next valley at Armadale Bay. On the next hill back out of the valley I was overtaken by a couple of guys that I had seen in the Bettyhill Hotel bar the previous evening. They were heading up the hill much more easily than I and so I was happy to let them go past. I soon met them again at the summit where I stopped at the same car park come view point as them to get my breath back and, more importantly, take in my first view of Orkney which was visible for the first time on the horizon. I hung around long enough for the other two to set off before me. I was relaxed with the idea that they were quicker than I, but I didn’t feel the need to be reminded. A minute or two after them I set off back on my way; only to find that they had stopped again a few hundred yards up the road. I rode past them and sure enough a minute or two later they shot past me again. More up and downs followed; through the valley at Srathy then up again before dropping past another corrugated iron church at Melvich and down over the Halladale River past the excellently named ‘Big House’. At some point around here I had crossed from Sutherland into Caithness (there was a sign; but I can’t recall exactly at which point it was). After Big House and one smaller climb the next view ahead of me included the dominating appearance of the (disused) Dounreay nuclear power plant. I wasn’t going to be going past Dounreay itself but I did stop for a break on a bench next to a cemetery in Reay village for a quick Babybel, bread and fudge break. The residents of the cemetery are clearly well read as the mobile library was also parked up here as well. I wonder what they were reading? A bit of Wilkie Collins perhaps? From Reay I turned off from the main road, though still following cycle route NCN1, onto a back road into Thurso. The road should have been quite nice but, as it takes a shorter distance into Thurso when compared to the A836, it was quite heavily used. The road is also very straight for a few long periods so a high percentage of the passing cars were travelling at some considerable speed. Despite this I was soon on the outskirts of Thurso and dropped down into the town. A couple of Cycling Tourist Club (of which I am a member in its current guise of ‘Cycling UK‘) ‘Winged Wheel’ badges on the older hotels in the town suggested that I was in a very popular cycling touring area! I did consider finding a café for a fuller lunch but instead found myself by a nice bench on the sea front so opted for more of the usual food stuffs instead. Babybel was starting to get a bit tiring by now; but the fudge is still excellent. Heading East from Thurso the cycle route diverts again from the main road for a few miles. I wish that maybe it didn’t. The main road follows the coast and looking on the Ordnance Survey maps appears to travel quite flat and takes the more direct route to Castlehill. The cycle route on the other hand diverts off the direct path in order to find another long drag for a couple of miles. The day was quite warm now and I was glad of the water. There was at least a nice enough view back over Thurso and after a couple of miles the route took a turn to the left and then dropped back down nicely into Castlehill. I was considering abandoning the official route now and sticking to the main road. I was going to be diverting away from NCN1 for a few miles anyway; but at the crossroads in Castlehill something made me choose to continue to follow the route 1 signs straight over rather than turn right onto the A836. I’m glad I did. Had I not carried on I would have missed the ruins of the Castlehill flagstone factory. In the 19th century the area here was one of the major producers of flagstones in the country (Regent Street in London was paved with Castlehill flags). Production has long halted but there is a lovely wild trail in and amongst the mills and factory buildings, down to the harbour built to send the finished product off around the country by ship. I should have been continuing my progress but was entranced by the site. The accompanying Museum and Heritage Centre was closed today, but none the less I can highly recommend taking some time to explore here. I was soon back on the A836 and from here I turned away from cycle route 1 and onto the main road. A short way along the road next to Dunnet Bay I first discovered one of the mildly embarrassing side effects of cycling in this area (particularly with a loaded bike). Another cyclist was heading in the other direction, also on a well laden bike. “Go on. You’re almost there. Well done”. Almost there? Almost where? Never mind; I’ll just carry on my way. At the end of the bay (which wasn’t visible behind the sand dunes) at Dunnet village I left the main road again in order to head for, well, the head. A couple of miles rising up the hill later and I was pulling into the car park at the top of the cliffs. There were about half a dozen other cars parked up but within a few minutes I found myself next to the lighthouse all by myself. With no one around to witness the scene, I set my phone onto a mini tripod and took a picture of me celebrating being the most northerly person on the British mainland. After the disappointment of Cape Wrath I had made it properly to one of the ‘Points’ on my ‘All Points North’ ride. I had a good explore around the headland. The lighthouse itself is off limits but higher up behind it next to some old World War Two defences there is an excellent lookout spot to get a full view of the road both behind and ahead. Back in the saddle I glided back down the hill, cutting a corner across through the small settlement of Ham with its old pier and mill buildings, aiming to re-join the A836 a mile or two east of Dunnet village. Just before the main road junction I checked my phone and noticed some erratic behaviour on my GPS. Up at the head it had gone totally haywire and was showing readings all over the shop. I don’t know what there is hiding up at Dunnets Head but I reckon that there must be some sort of strange government test facility that was interfering with the GPS! I had to restart my phone to get it working again. On the main road a couple of cars coming the other direction beeped their horn,s flashed their lights and waved at me. Confused I stopped and gave my bike a once over. I couldn’t see anything wrong. I still had the best part of another ten miles until John O Groats and really didn’t want to start having any mechanical issues now. The remaining miles went smoothly by. The landscape has a few hills still but it was all quite calm riding and before I knew it I could see the end in sight. The A836 comes to an abrupt halt where it meets the main north-south A99 road about half a mile South of the famous village centre. Turning onto the road and heading North for the final stretch, some more people cheered and waved at me. That’s when I realised that everyone had just assumed that I had started my ride, not from Inverness, but from Land’s End. I was embarrassed, but glad to have realised why people had been saluting me over the last ten to fifteen miles. 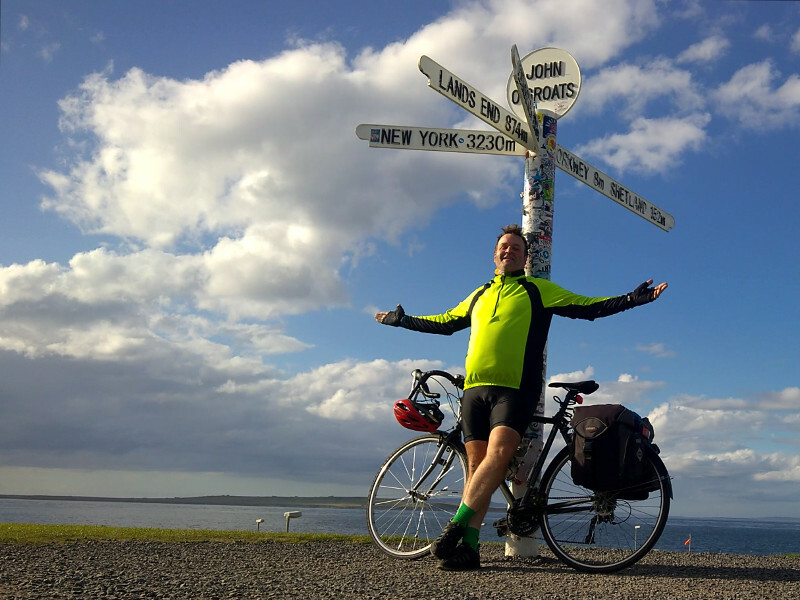 I glided down into the centre of John O’Groats and up to the famous signpost. A couple of people were already stood by the sign taking photos but again they applauded me as I got off the saddle. Sheepishly, once the current people had taken their photos, I set up my mini tripod and took some selfies of me against the sign. As I moved away a father with his son (somewhere about 7 years old) told the boy to congratulate me which he did very nicely. By now I had decided that the best course of action was just to go with it so I thanked him very much, feeling only a bit of a fraud! I wasn’t quite done for the day yet but I needed some food and a rest so I popped into the Storehouse Café for a sandwich and a coffee. Refreshed I started on the final push. 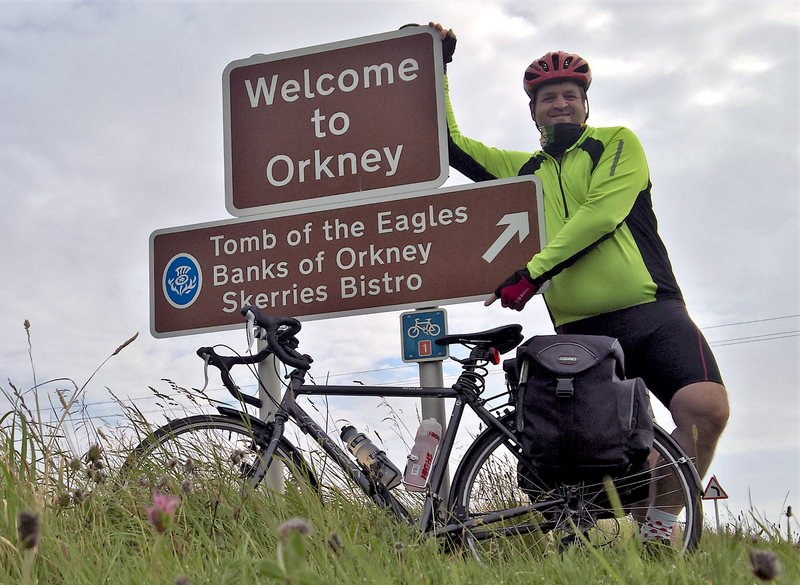 John O’Groats might just be the end of the road; however it is not the farthest point. A few miles along a small side road, and winding up and down some hills that I frankly could have done without, I came to Duncansby Head. Pulling up to the lighthouse at the end of the road I had now made my way to the most North Westerly point on the mainland, and ticked off the second ‘Point’ of my ‘All Points North’ for the day. I spent a bit of time watching the bird life living on the cliffs and admiring the Duncansby Stacks from the hills above. The end of the day was in sight however, and I still had to wind back down and up the hills in order to find my B and B for the night. As I rolled into the Hamnavoe guest house the landlord, Gordon, met me. He was about to head off for a rare night out but quickly showed me to my room, telling me that I would be best off storing my bike in there. As he was about to leave the guest house I looked around and, finding something missing, asked Gordon if he had given me the keys. “Oh there are no keys. You don’t need them. There is no crime here. Not like Inverness”. I took a long and much needed shower before walking back down to the harbour. I spent some time watching the sun set over the very north of Britain. The sunset was glorious and this was a beautiful way to end a long but rewarding day. As the sun finally dropped I made my way back, stopping en route at the Seaview Hotel. I was officially too late to order food but they kindly did me a burger and chips which I washed down with a pint of Best from the John o Groats brewery located less than 100 yards up the road. The food wasn’t great but was much needed. Having finished, I made the final short walk back to the guest house and fell almost instantly asleep.